TNYO: Adrian Belew you completely blew me away at Joe’s Pub the other night Booom!! My mind was completely blown out. I just sat there in awe I tried to figure out how the music was making me feel and also trying to understand and make sense of what I was listening to, was there a name of the songs or the set of songs. Adrian Belew: No there’s not a name, but we call the solo show "Painting With a Guitar"
Which is a reference to the paintings of mine that I brought along and were on easels on stage the set is made up of a fair amount of new material that I haven’t put on record yet and a selection of music that I don’t usually do in concert. 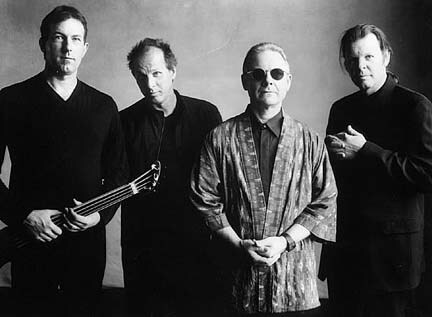 I try to shy away from the things that my fans have heard me do with the power trio which is my normal rock concert band or King Crimson so this is a different presentation of music that no ones ever heard. and the setup you were using? Adrian Belew: The guitar I was playing is the Parker Fly Adrian Belew signature model. TNYO: I noticed there are no dots on the fret board. 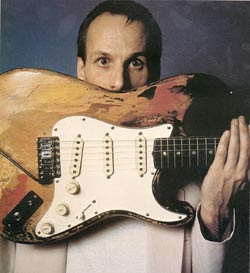 Adrian Belew: No that’s just one of the things that Ken Parker did to separate it from other guitars the fret markers are at the top of the neck as you look down on the guitar so that you see them when your looking down at your hands but you don’t see them from the front of the guitar. TNYO: Adrian where are you from where did you grow up? Adrian Belew: I grew up in northern Kentucky right across the Ohio river from Cincinnati, I have been living in Nashville for 15 years now my wife’s family is from there so we set up a recording studio in our home 15 years ago and we have been going at it ever since. TNYO: How and when did you decide to become a professional musician? 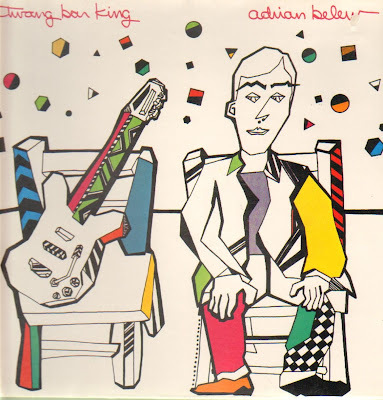 Adrian Belew: Well I started playing at age 10 in the junior high school marching band as a drummer I knew I wanted to play something in music, do something in music, but I wasn’t sure what. It was at age 14 when the Beatles arrived it took a hold of my world and I realized that’s what I wanted to do was become a recording artist. By age 16 I was happily ensconced in my first teen band playing Beatle songs as the drummer and singer. But I couldn’t explain the songs I had in my head so I had to teach myself to play so at age 16 I took two months and taught myself the basics of the instrument and started playing the songs that I could hear in my head. Around that time frame the great guitarists of the sixties Jeff Beck, Jimmy Page, Eric Clapton, they arrived on the scene and that convinced me that maybe the guitar was a voice so I started playing more guitar. musical compositions, that you didn’t read any music, so you must have been born with perfect pitch. 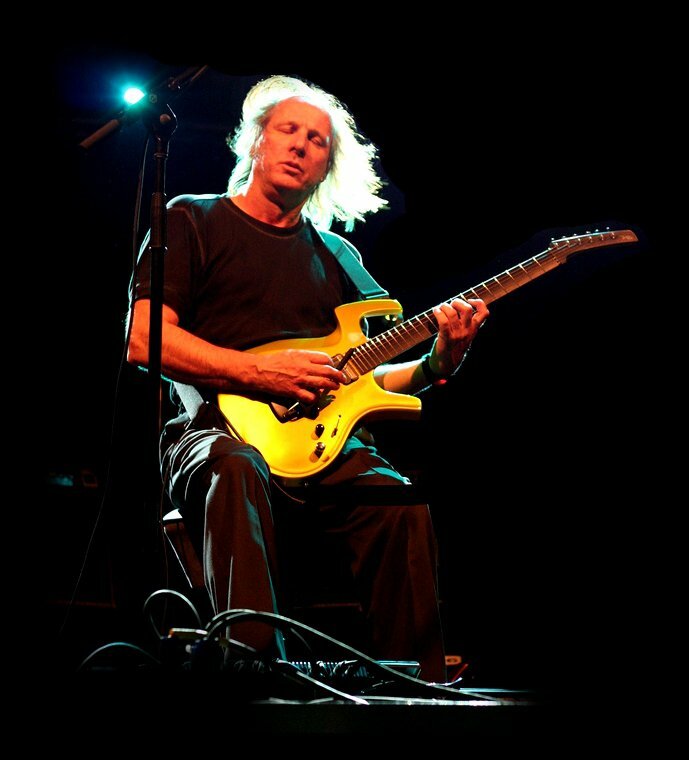 Adrian Belew: I have Perfect relative pitch in other words if I take the strings off my guitar which I do pretty much after every show when I restring it, it will be right in perfect pitch where the e string will be right where its supposed to be. I don’t think I have perfect pitch otherwise but I guess that after 35 – 40 years of tuning instruments you finally get close to perfect pitch. What I do have and had, as a kid was some sort of understanding of harmonization and things like that so it was there for me to tap into although I never had formal training. I instinctively understood when I heard records I understood where the harmony should be and I understood things about rhythms that an ordinary person probably wouldn’t know. TNYO: Can you tell me about one of your craziest nights on tour? Adrian Belew: (Giggles) Wow Craziest nights on tour? Gee you should read my blog its full of anecdotes from all of the different things I have done, I would probably point back to playing Madison Square Garden with David Bowie which was a memorable crazy night with an audience full of famous people like Andy Warhol, Dustin Hoffman, Mick Jagger, just a super huge event. That’s the kind of thing that sticks with you, most of my shows I try to make them not to crazy so that they can actually be what they are supposed to be. I am concerned with the quality of the performance. TNYO: What was Frank Zappa Like? TNYO: Did you meet Steve Vai who was another Zappa Musician? 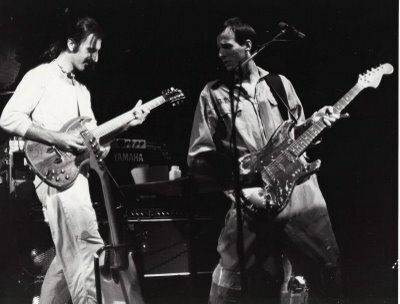 Adrian Belew: Ya I met him a few years after I was with the band and then Steve got in the band and then we crossed paths many times since yes he’s a good friend of mine. What do you think of bands like Radio Head? They’re a great band of course and they have some originality. A lot of bands today are just derivatives of music that I grew up with, which is a little bit unfortunate I think because if you have the real thing then the derivative thing is not all that interesting, so it takes a good band like Radio Head one of the few bands that I can think of that make me perk up and listen. Adrian Belew: Whenever people ask me I call it intelligent rock music.. See I know that’s an oxy moron (giggles) I believe its been classified as hard rock or progressive but I still don’t really feel like its in either of those categories King Krimson at one point in time before I joined the band was the leader of progressive rock music but the music that we have made in the last 28 years or the music that I have made on my own doesn’t really fit that categorization.. I don’t know I hope its just its own kind of music I don’t really have a name for it. TNYO: I heard a lot of ascending and descending scales and a lot of the rhythms that you were playing that reminded me a little bit of worker bees building colony’s is there a similar feel in what you see and hear in those songs that your constructing? And could easily be adapted to film scores and things like that. imagination from the listener so even in my lyrics I try very hard to make sure that I don’t strip the listener bare of any imagination I try to make a lot of my lyrics more general or metaphorical so there’s still something in there that you can twist your own way. You mentioned you were putting together a rock opera in Amsterdam can you tell me a little about that? 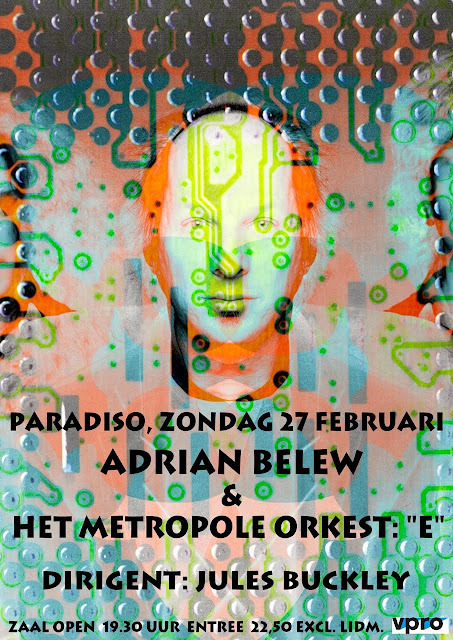 Adrian Belew: Well its not a rock opera, it’s a symphonic piece, it’s already on record with my rock trio its called e just a lower case letter e it’s a 43 minute piece of music in five sections I have developed over the last three years for the power trio in particular but as I mentioned in concert I also had an eye towards music that could be orchestrated for an orchestra so what I am doing on February 27th in Amsterdam is I am going to be the guest guitarist in front of a 40 piece orchestra playing my own 43 minute piece of music called e. It’s going to be a milestone in my career and its something I am very excited about and a little anxious about. TNYO: I hope we can get to Amsterdam to see that. Adrian Belew: I am hoping to film the actual performance and make a DVD about it I can’t promise that for sure but that’s something I am talking about with the people that are putting this whole thing together. someone to list me as one of the guitarists that they like, its hard for me to put myself in the category of guitar gods because as I mentioned earlier I grew up listening to Jimmy Hendrix, Jeff Beck, and Eric Clapton and they are hard to follow. I really think of myself as more of a recording artist that uses his guitar as his primary tool but if you want to call me a Guitar god then I am happy to except that honor. TNYO: I absolutely will your one of the tops in our book, Question if you weren’t a musician what would you be? Adrian Belew: I have no idea, I mean if there’s one thing I could think of ….. I am not sure … how far down the list I would fall, I have a lot of vintage cars and trains maybe I would be something in that business, I love animation maybe I could be something in that business I love reading books, maybe I would be an author, I have been doing a lot of painting in the last five years maybe that’s something I would have chose as a profession. I cant see myself being a professional something like an attorney or a doctor or something like that my choices would always be something on the artistic romantic side. TNYO: How many gigs do you play a year? TNYO: The show at Joes Pub you had some of your paintings on stage they had a childlike playfulness a quality I love in art, the couple at my table were asking if they could buy them and I heard many people in the crowd saying the same thing. I was thinking that children are the greatest artists, they are pure and untouched by influences and preconceptions giving the art they create a certain truth that’s hard to find in adults, whats your take on this? 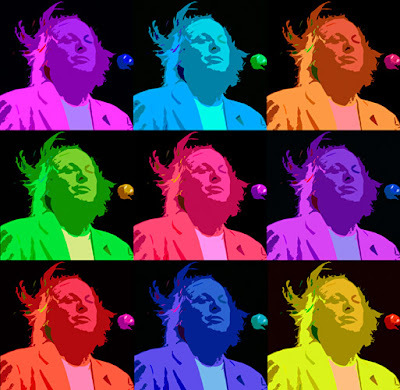 Adrian Belew: I think that my art (paintings) probably is pure because I don’t really know what im doing, so pretty much every time I go about making a painting I am experimenting and trying things and changing things around until it looks the way I would like it to look, I am kind of child like in the way that I do the paintings. I paint them really for the joy of being creative; I don’t have any intentions of really selling the paintings as much as I have the desire to keep them in my house. Adrian Belew: Well when I am painting I make them in my studio in the same place where I make music I have a corner set aside and I take the canvas that I am working on and just lay it on the floor I don’t put it up on an easel, for me I just like to get down there on my hands and knees and getting down there into the painting then starting to work. experimental alchemy to get it to do things interestingly Like layers that will cause the painting to have more of a dimensional effect to it I really for the most part consider my paintings to be abstract I usually don’t try to paint something like the way it should look. Most of the time they are happy accidents. TNYO: How do you end up winding down after a show? 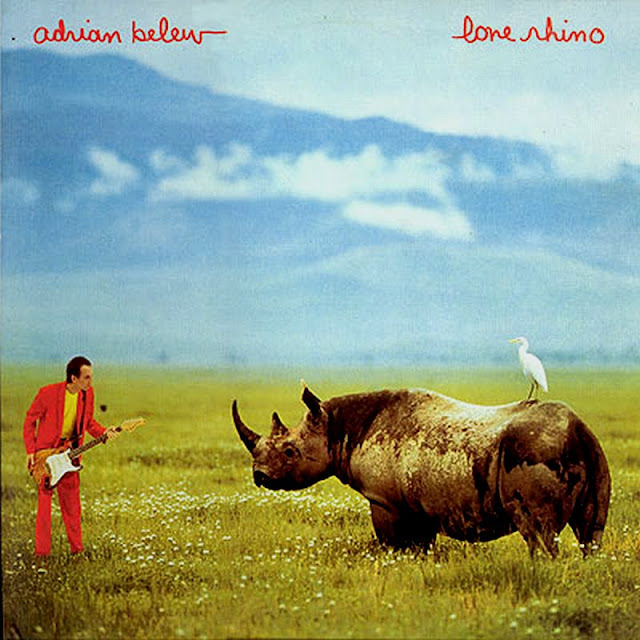 Adrian Belew: Oh.. well.. I always have a book I am reading, I am a voracious reader these days I have been reading with my ipad so I don’t have to carry books around I have many of them in ebook form, but I am still very attached to books themselves I like to collect them I like the tactile quality of having pages that you can turn. Usually at the show ill have a drink or two read some and that’s it.